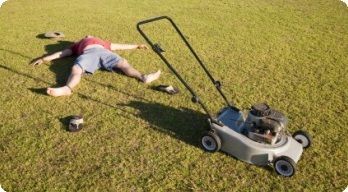 It’s autumn, and there are only a few weeks of lawn care left. Maybe you want to think about a different use for your yard (if you have one) next year? Each year summer appears for several months. The weekends rolls around. What time is it? Lawn mowing time. Out comes the lawnmower. Check the oil. Check the gas. If you need more oil or gas, buy some. Does the lawnmower need maintenance? Forgot about some damage to it from last year? Make sure it’s not to early to wake up the neighbors. Then off you go to a noisy few minutes depending on the size of the lawn. It can be tiring if it’s large. All the time and energy gone into repeatedly cutting down something and getting nothing out of it. Plus the energy of fuel that cost money. Also, many people use chemicals on their lawns. That’s another cost. There is the health and environmental cost of all these chemicals and pollutants. Liquid fertilizers easily go back into the local water supply, as do other chemicals that affect us and other life. But… what if we lived a different way? What if we grew food, instead of putting in our time and energy into repeatedly cutting down decorative, ornamental aesthetic grass? Like it says. Pretty simple. Mow the grass one more time. Then till the ground for the plants that come next. There is small maintenance here and there, before and after the growing season. But after some time, you get free food as it ripens, right in your yard! Even beyond urban and country areas with lawns, this can be expanded to city living. In the city, we can still do some things now. Of course we don’t usually have lawns to deal with, but we can still grow plants on balconies. 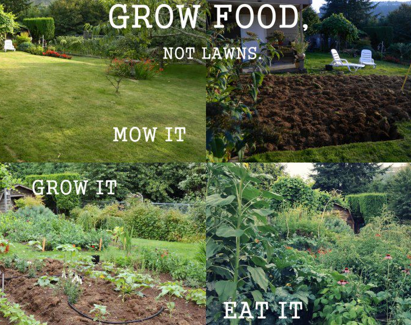 Grow tomatoes or other small fruits/veggies. It will save you from buying them. It might cost something at first, but if you do it every year, it doesn’t cost much to maintain and each year you get to reap the fruits that some small labor bears. 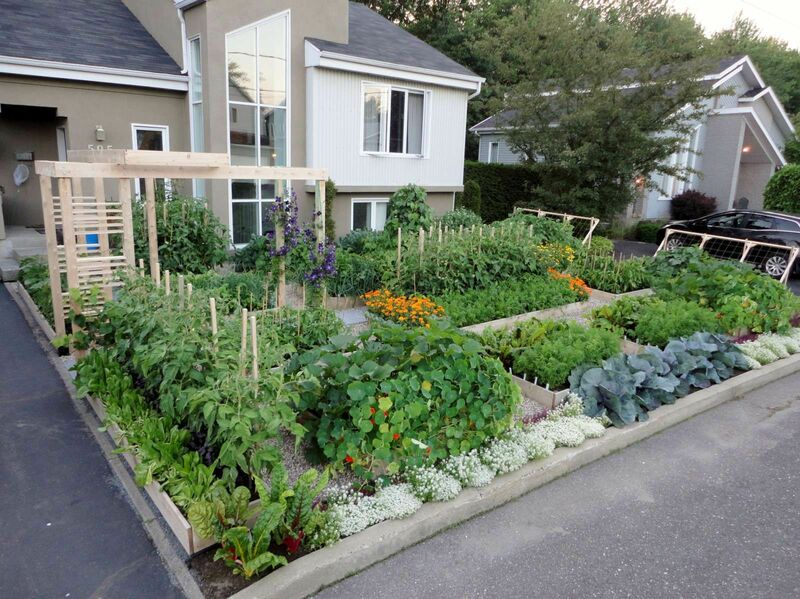 There are some urban permaculture projects in some cities and various communities. 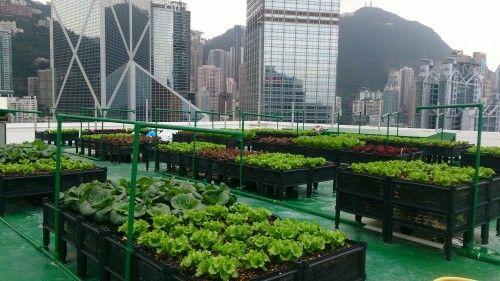 There are event small city farms that are being developed on normal flat land, along with indoor and rooftop businesses. 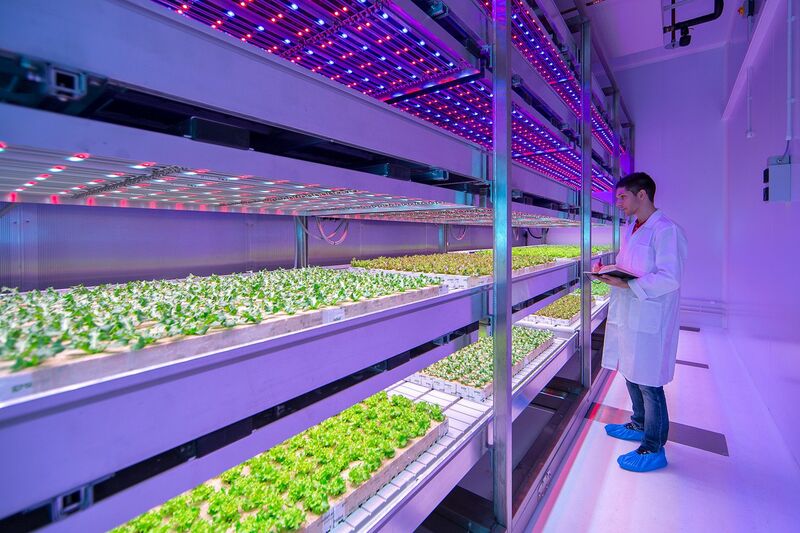 There are great potentials from bringing our food production into the city closer to our homes. For one thing, it already reduces costs in transportation (money, pollution), and makes cities more sustainable in case of economic hardships. This is a New Way of life I want to be living in. This is what I see as part of the future. If you have not heard of seed swaps, but have heard of food swaps, it’s the same thing but with seeds. 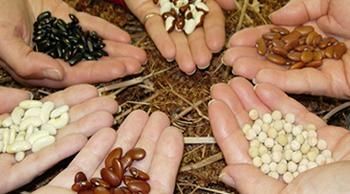 Get together at some time, meetup, and exchange some seeds so every one can grow a variety of food. Alternatively, in a community, people can decide to grow mostly one thing, and then everyone exchanges based on the staple they are known for producing. This is swapping your harvests and getting an even spread through a more individual monoculture growing operation as a cooperative community. If your neighbors don’t appreciate what you are doing, they can lobby the municipal council and get “laws” enacted to prevent your self-sufficiency and restrict your freedom. Either in urban areas with lawns, or even in apartments or condos with balconies. Be careful with other people. Doing this, even as a garden, is a good way to share food and information and get others accepting what you are doing or plan to do. 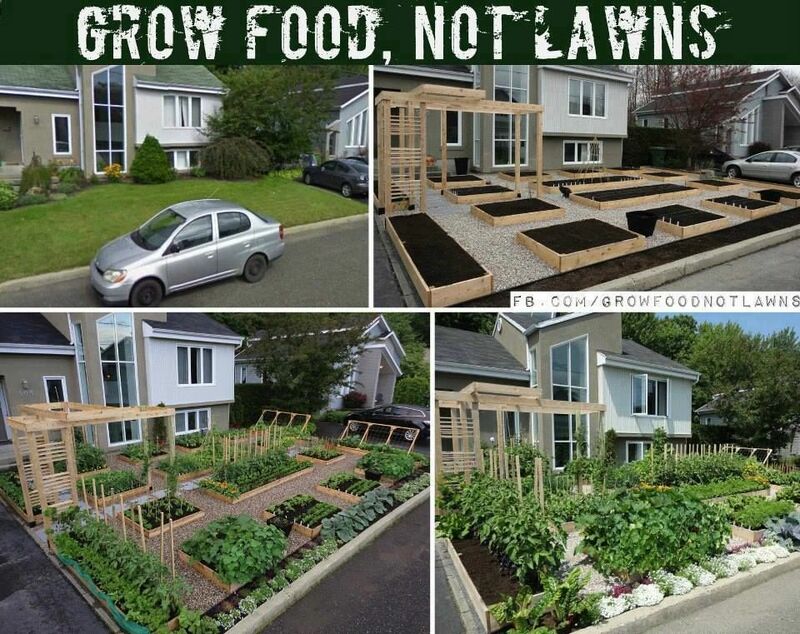 Grow free food that feeds you pesticide-free, instead of lawns that do nothing but appeal to the facade and mask of cleanliness and “beauty” in society. Food plants are beautiful. 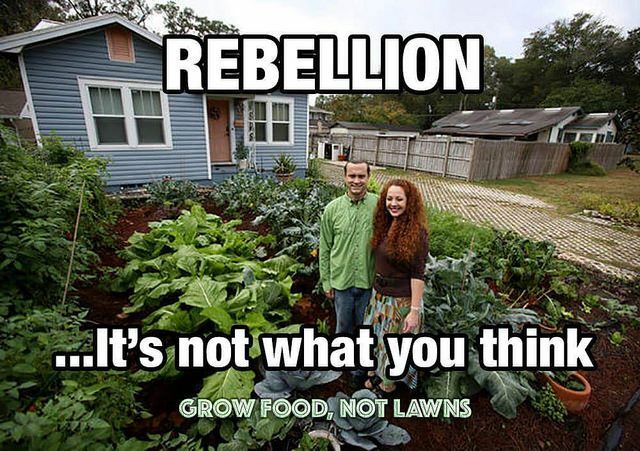 Grow food for yourself, compost, expand into the community, take over the world and have abundance everywhere! Imagine that future… walking around our neighborhoods and seeing fruits trees, with other shrubs below and vegetables growing alongside. We can just grab an apple as a snack as we walk by, pluck some blueberries and strawberries… Food issues will be a thing of the past. We can minimize one aspect of our expenditures: the focus of a large part of our economic survivability towards food. This would help so many people throughout life. We can make things more like this, if we choose to. Those who have individual power of their own lands can. 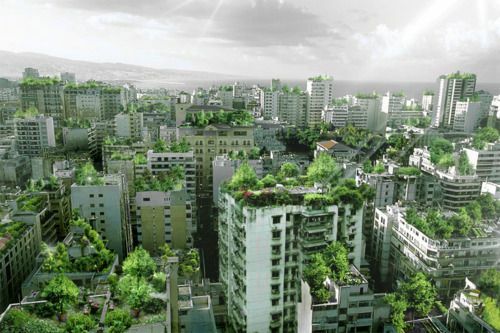 Everyone can get municipalities to grow food instead of grass, flowers and other trees. Or we can simply do it, since we are the society. We are the community. We decide how our lives are to be led.